Danny Danon, the MK who brought Glenn Beck to the Knesset, talks about the controversial US talk show host and about Israeli hasbara. "People always complain about the poor job we are doing in PR and hasbara," stated Member of Knesset Danny Danon. "I think Glenn Beck is an example on how to deal with hasbara," MK Danon stated. "Just put out the facts and do not be afraid to reveal the truth." As chairman of the Immigration, Absorption and Diaspora Affairs Committee, it was MK Danon, who brough Beck to the Knesset. 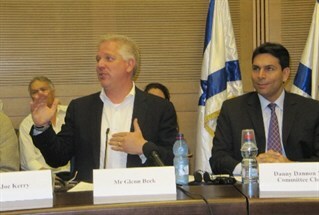 Israel National Radio's Josh Hasten spent time with both MK Danon and Beck at the special Knesset session last week. He interviewed MK Danon on the Israel Hasbara Hour podcast. MK Danon said he sees Beck as a pro-Israel supporter and said that Beck was one of the few American talk show hosts to discuss the killing of the Fogal family in Itamar by Arab terrorists. Danon advocated a similar outspoken style for the Israeli public relations community. "If you want to win you have to be brave," he stated. Hasten asked Danon about the perception that Beck is too controversial. The Anti-Defamation League and other Jewish-American groups were appalled by Beck's "Puppet Master" expose on the Jewish-born financier George Soros, calling it anti-Semitic. Danon said despite the controversy, Beck is an ally. "I learned from Menachem Begin in the 1980's. He said that when you have a friend who is willing to help you, you should work with him. I know that in the US some like him and some don't. But I think he's doing a good job and I'm sure there are more like him on TV and radio," Danon commented. As far as the concept of hasbara -- the Hebrew name for public relations -- Danon stated, "I'm not sure you will like this, but if I would have to choose between hasbara and security, I will choose security. For example the Goldstone Report [that bashed Israel for Operation Cast Lead]. I wouldn't prefer to compromise the people of Israel. But I think we can win both. But we have to take a stand and speak in a different language." MK Danon said that while he applauded the effort of those working to promote Israel around the world, "it's hard to win, because they are too diplomatic. Don't be afraid to attack."